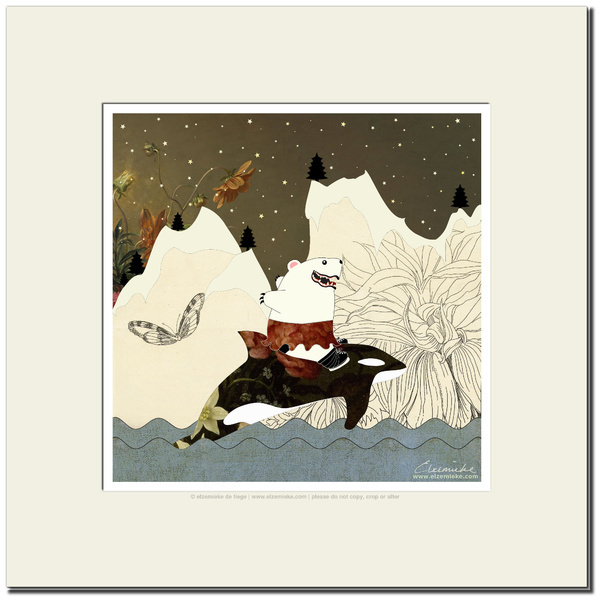 This listing is for a fine art print, titled "Polar Light". The print will be delivered with an off-white passepartout (see the image at the top), ready to pop into a 30 x 30 cm frame. "Polar Light" depicts a polar bear on ice skates (!) surfing across the icecap on the back of a killer whale and literally having the time of her life. I created this piece by layering different paintings over each other, so the sky is actually a section of an original oil painting by one of the old Dutch Masters. Isn't that cool? I think it is. When you hold the print up close, you can see the different textures and craftsmanship. It's beautiful!